Pizza is the simplest and most versatile weekday meal. Keep pizza crust and olive oil on hand and scour your pantry, freezer and refrigerator for pizza-potential ingredients. Maybe it’s Greek-style pizza with feta and olives or veggie pizza with spinach, broccoli, red onion and banana peppers. Unlike red sauce, this olive oil based "white sauce" pairs nicely with every pizza topping imaginable. 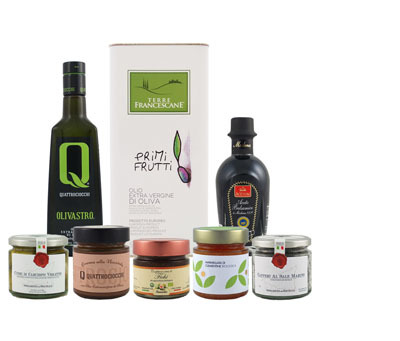 The Terra Francescane Rossa olive oil was chosen for its pleasing harmonious quality. The warm, fruity notes pair well with the turnip’s slight sweetness. If you’re making crust from scratch (recipe below), use the same oil in the white sauce and the dough for a truly harmonious meal. Turnips are the underdog of root vegetables, rarely the hero of any recipe. It’s time to give turnips their day in the sun. Similar to a radish except not at all spicy, they can be eaten raw, but are more often mashed, roasted or sautéed. If your turnips didn’t come with their greens, substitute any sautéing green or forget the greens altogether. In a pour-friendly container, mix together all ingredients for the white sauce. This can be made ahead of time and kept in a sealed container. The longer it sits, the more the flavors will meld together. Prepare your pizza crust. (Use the crust recipe listed below or follow the cook time and oven temperature instructions that accompany your chosen crust.) Pour half of the white sauce onto the crust and spread evenly. Place an even row of sliced turnips, then drizzle half of the remaining white sauce over top of them (reserving half for the greens). Crumble goat cheese over the turnips. Uneven chunks are fine. Place pizza in oven and bake according to crust instructions. When done, crust will be browned and goat cheese will have browned tips. While the pizza is baking, pour the remaining white sauce into a large skillet over medium/high heat. Add the turnip greens. Make sure not to crowd the skillet leaving room for the greens to breathe. Stir frequently until greens are wilted, about 5 minutes. 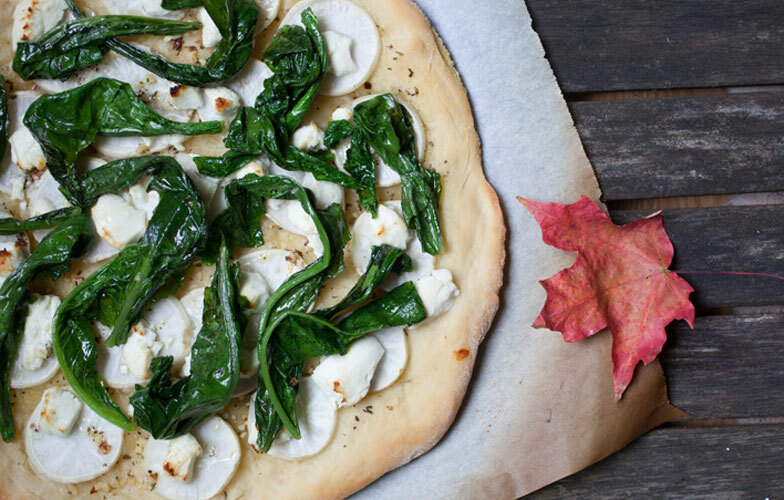 Top pizza with sautéed greens and serve immediately. Makes 4 servings. Any dough recipe will do, but here is one in case you need it. This recipe requires overnight refrigeration and a 2-hour rest time before baking. Keep ingredients cold when possible. Stir together flour, salt, and yeast in the bowl of an electric mixer. Gradually mix in oil and cold water on low speed with a paddle attachment until flour is absorbed. Switch to a dough hook and mix on medium speed for 5 to 7 minutes. Dough should clear the sides of the bowl but stick to the bottom of the bowl. Add water or flour if dough is too dry or too sticky. The finished dough will be springy, elastic, and sticky, not just tacky. Place a tablespoon of oil into a large bowl. Cover your hands in flour. Separate dough into 3 equal pieces. Lift each piece and gently round it into a ball. Individually roll dough balls in the bowl with olive oil. Transfer dough balls to individual zippered freezer bags and let the air out before sealing. Store extra dough in freezer for up to 3 months. When you’re ready to use unfrozen or frozen dough, place in refrigerator overnight. Remove dough from the refrigerator 2 hours before making the pizza and let rest on the counter with bag unzipped. Generously dust a sheet pan, parchment paper or pizza stone with cornmeal. Cover hands and counter surface with flour and shape dough into a pizza shape. If dough keeps springing back, let it rest for 5 to 20 minutes and try again. When dough is stretched to about 12 inches in diameter, lay it on the pan covered in cornmeal. Top pizza with desired toppings and place into preheated oven at 450 degrees for 8-12 minutes, or until crust is browned.